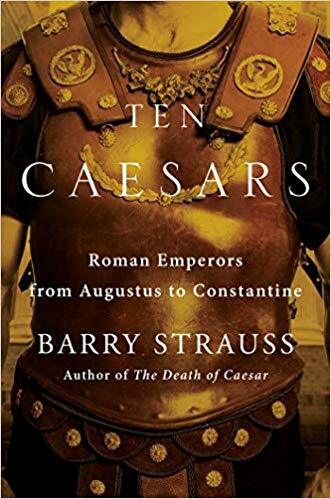 Strauss provides a concise look at the rise, rule, and fall of ten of Rome’s most important emperors. Since he devotes roughly 30 pages to each, it’s little more than a thumbnail sketch which might be perfect, or not. I did learn a fair amount from this book, and also learned some of what I thought I knew was incorrect (I’m talking about you, Robert Graves’ of I, Claudius.). But ultimately I was disappointed by the shortness of the entries. I wanted more. Strauss certainly makes his subjects approachable. His language is casual and contemporary, not at all what I’m used to in a history. It’s not often you find a pop cultural reference in serious books, but there was Game of Thrones cited to describe a battle between several would-be-Caesars. The emperors covered include Augustus, Tiberius, Nero, Vespasian, Trajan. Hadrian, Marcus Aurelius, Septimus Severus, Diocletian, and Constantine. Some were little more than names to me before reading this–especially Trajan and Hadrian, whose names are attached to ruins/structures I’ve seen. In the case of Marcus Aurelius, I was ashamed that I had never even heard of his Meditations, which (Strauss claims) is the second most read book in the world after the New Testament. Of course, it’s now on my ever-growing “must read” list. I did appreciate that he made a strong effort to include the women who propelled, advised, and influenced his emperors. Reading about the mothers, wives and other women around these powerful men helped to shape your understanding of them. However, the greatest enlightenment for me came from how he portrayed the Roman people. I understand their philosophies, values, and other attributes far better than before. That was the best thing of all. It starts with Augustus and ends with Constantine. However, Strauss also provides some connecting information to help with the gaps that occur between certain Caesars. That helps one’s understanding of how and why different ones came to power. For more about Barry Strauss and his books, click here. I enjoy thrillers and Steve Berry has been a long time favorite, but not this time. The “twist” was obvious from early on in this story of intrigue involving the Knights of Malta and the election of a new pope. Berry started his series featuring former Justice Department operative Cotton Malone with a terrific thriller built around the Knights Templar. For his 14th book in the series he returned to one of those religious/martial groups: The Knights Hospitaller of Jerusalem, Rhodes, and Malta (depending on the century). I had high hopes due to the subject matter, but this series has gone stale. This seems to be a recurring problem for thriller writers. It’s not that Berry isn’t finding new historical “secrets” or theories to exploit in his books, but the increasing weight of the main characters relationships and backstories simply drags things down. I had high hopes Berry was going to start a new series with The Columbus Affair, which starred an interesting investigative journalist, but that turned out to be a single outing. Sadly, this book was so disappointing it will probably be the last one of his I read. A cardinal with popish ambitions is given information that could make his dreams come true. However, American and British operatives are paying close attention and are suspicious of his actions. For more about Steve Berry and his books, click here. A cherished classic since its publication, Buck’s portrayal of rural life in early 19th century China is still highly readable and inspiring. Though the cycle of success and catastrophe occasionally feels predictable, isn’t that what life is? A series of ups and downs often driven by unfortunate behavior? Buck’s book is credited with demythologizing Chinese culture, making it easier for Americas to accept them as allies during WWII. It certainly appeals to our domestic sensibilities: hard work pays off and hubris leads to disappointment. Beyond that, the characters are engaging, particularly Wang Lung, the poverty-stricken farmer who cares deeply for the land he tends. The novel follows his life is followed from his wedding day to the day of his death, with incredible setbacks along the way. Yet Wang’s spirit and his love of his good earth never falter. On the other hand, with our modern attitudes, his relationship with his wife, a former slave, takes some getting used to. He doesn’t really see her as a human being and is truly surprised when she occasionally behaves like one instead of a downtrodden servant. A devious uncle, an opportunistic madam named Cuckoo, and other characters add lively notes to this novel, taking it well beyond a book about the weather-related trials of farming. It’s an easy and interesting read, opening a window on an earlier time as seen through the eyes of Buck, an American who lived and loved that land–just like Wang. Wang is exuberant about gaining a wife, a slave from the great house of a wealthy family. However, claiming her is a humiliating experience. Nevertheless, he is content because now he has someone to take care of all the household chores so he can focus on farming, and hopefully earn enough silver to buy more land to farm.